Quick post today, because my parents will be here in an hour to keep working! (Today is their last full day here, and we still have so many things on the list: swap out more storm windows for screens, clear off a few inches of compressed leaves from what I think is a stone patio out the back door, hang prints, decide about curtains/curtain rods, wash the outsides of the windows…) I’m excited to show you all of our progress very soon. 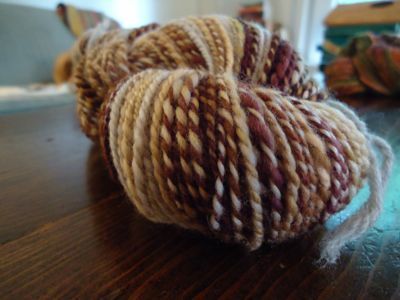 These pictures are of my finished skein and change of some SCF organic merino in cosmopolitan. I split the fiber lengthwise and was aiming for long repeats, and while there is more barberpoling than I was aiming for, I’m happy with the result. 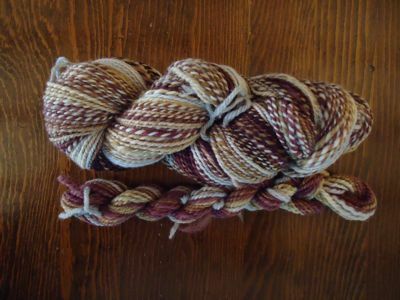 This is 230 yards (205 + mini-skein of 25) of squishy light worsted weight wonderfulness. I’m so excited to check out all the patterns you suggested for my Rhinebeck-cauldron. Any thoughts on this? It is super soft organic merino, so I’m thinking hat, cowl, or super simple fingerless mitts. Time to pour the coffee and gear up for another day of home improvements!